"New York will show this nation once again ... that the greatest success is shared success and that we build our brightest future together"
Today, Governor Andrew M. Cuomo delivered his 2017 State of the State speech in New York City. VIDEO of the event is available on YouTube here and in and in TV quality (h264, mp4) format here. Thank you. Thank you very much. Thank you. Thank you. Thank you very much. First, to our great Madam Secretary of State, who’s doing such a fantastic job, let’s give her a round of applause. His eminence, thank you again for your leadership once again, Cardinal Dolan. Our New York State Comptroller who’s doing a great job, Tom DiNapoli. We have Mayor Bill de Blasio of New York City, last time I was with the mayor we were at New Year’s Eve, a New Year’s Eve party in a subway station, Second Avenue subway – nobody had heard of it before. It went so well, the MTA is starting catering service, specializing in marriages, and they will time oncoming trains so the rumble happens right after the vows. It was a great night, Bill De Blasio, let’s give him a round of applause. Scott Stringer, New York City Comptroller, doing a magnificent job. Other officials, Court of Appeals and Chief Judge Janet DiFiore thank you. The past few days we have been talking about the State of the State. What is the State of the State as 2017 begins? Well, to put it shortly, the positive news is the ship of state is doing very well and is stronger than in decades. There are 49 other Governors in this country that give this type of report a report and I wouldn’t change positions with any of them. New York has made remarkable economic and social progress. Not since the time of FDR and Robert Moses has our government produced more impactful legislation, achieved more or built more for the people. But at the same time the troubling reality is, the sea upon which our ship of state sails is as rough and tempest tossed as it has been in over 50 years. Our New York credo – indeed our American credo – our progressive philosophy in providing opportunity for all, welcoming immigrants, fostering community, providing for the poor, respecting individual and religious freedom, and our country’s progressive philosophy is all being questioned, blamed and attacked. The generations of progress that we made on women’s rights, climate change, public education, and affordable health care are being threatened. There is a recent and powerful belief that America’s diversity, openness and acceptance is in conflict with the success of America’s middle class working families. That belief is both misguided and incredibly dangerous. It tears at our social fabric, and threatens to turn America’s strength into a weakness. We all heard the roar on Election Day. And we must respond. But we cannot lose ourselves in an apparent attempt to save ourselves. We must follow two paths forward. First, to admit, acknowledge and address the very real economic problems of our struggling middle class and second, to prevent misdirected anger from doing damage to our country’s core values. This year New York will enact a new economic program - the Middle Class Economic Act and institute a New York Promise agenda to protect and advance our progressive values and principles of social justice that are being challenged today. New York will show this nation once again ... that the greatest success is shared success and that we build our brightest future together. To begin New York must continue be strong and move forward. New York has maintained a level of fiscal responsibility unknown in the postwar era. After years of spending more than we took in, we have finally done what every family in the state of New York has had to do: we set a budget and kept to it. Our annual spending increases are lower than at any time since they have been keeping budget numbers. Our credit rating is as high as it has been in 60 years. Our unemployment is down from 8.4 percent 6 years ago to 5.1 percent today— and the good news is our economic success is felt all across the state. Today New York has 7.95 private sector jobs, the most in the history of the state of New York. And I would like to thank the State Comptroller for his great work in helping us maintain the fiscal integrity and responsibility of this state. Thank you. The state’s increase in spending is down because we are governing smarter. We cut the waste and we have prioritized better. We have invested more in education than any other time in history and more than any other state in the nation - SUNY, CUNY; the Master Teacher Program; and our statewide Universal Pre-K program. And I am proud to announce that this year we will increase funding for education to a new record level all time high all across the state and that New York City will receive more aid for education than it has ever received by the state of New York ever before in history. And we are building a new New York, from Montauk Point to Niagara Falls—from the LIRR to Penn Station to LaGuardia Airport. From the Kosciusko Bridge to the Queens Midtown Tunnel. From the Second Avenue Subway to the Javits Center. From our Harbor of Lights Bridges project to our New Jones Beach. We’re not just starting projects. But we are getting them done. And that’s government’s responsibility, and we are performing for the people of the state of New York. And what makes our economic progress even sweeter is that it is matched by unprecedented social progress. At the same time we did all of our economic work and our infrastructure, we passed Marriage Equality, Paid Family Leave, common sense gun control, $15 Minimum Wage: New York one again is truly the progressive capital of the nation. EB White my friends, would be pleased. The nation once again looks to New York to find the way up. I am proud of the work we have done and how far New York has come over the last 6 years. But this is not the time for self-congratulation. It is the time to prepare for the future. We will not stop working until the bright light of opportunity shines on all New Yorkers. We still have two educational systems – one for the rich and one for the poor. Separate and unequal and that my friends, is intolerable in 2017. We still have a judicial system that is supposed to be blind, but that all too often finds the scales of justice tipped by resources or race. We still have an electoral system that protects the prerogatives of politicians at the expense of voters. Our country’s economic transformation has made a handful rich and masses redundant. Our people still lack trust in government and for good cause. And the government must do more to earn trust. Our safety net is tattered and we have record numbers of homeless on our streets, our jails have become the mental health system of last resort and acts of discrimination, hate crimes and racism are on the rise. Most pervasive, our middle class is hurting and angry at their lack of progress. In terms of real wages, the earning potential of working families is less than it was 20 years ago. They are paying the bills, but lacking security. Our middle class feels abused. They were collateral damage in the economic shift from a manufacturing economy to a high tech economy. And they feel that their government did nothing to help. In the recession of 2007 the middle class saw their hard earned equity in their homes stolen. Nearly half the homes of our middle class are not yet back to their pre-recession value. Just think of it. That home equity was their life’s work, their security blanket, the payment for their daughter’s wedding, it was their business loan, and their child’s college tuition. It was taken through no fault of their own. But they never got it back and no one even went to jail. Justice was never done. And that is not the American way. The dream that their children would have a better life seems more and more elusive as the cost of college and housing goes up and up. Student debt now surpasses credit card debt and consumer debt and more college graduates are living at home than in decades. We can quote economic recovery numbers all day long; it’s not their reality. Talk to the people from my home county of Queens. Go to the gas station on Hillside Avenue where I worked, the pizzeria where we hung out. It’s not what they feel. It’s not their reality. And this opposition and conflict is what is causing the rough waters we see and feel all around us. We understand the anger and we will address it. Today I am proposing a Middle Class Recovery Act. It has three components: jobs and infrastructure; access to education; and lower taxes. Our top objective is to keep growing and attracting jobs to New York. We must continue our investment in building the infrastructure that will support 21st century economies. New York has lived off its inheritance for too long. We must build for tomorrow or other states and countries will continue to pass us by. Mass transit will enable our sustained growth. This year we will build a faster and better subway system with 1,200 new cars, dozens of rehabbed and modernized subway stations, and 20 rebuilt commuter stops. And let’s give Tom Prendergast, chairman of MTA, a big round of applause for the good work he is doing. We are building a new LaGuardia and last week we announced a 10-billion-dollar plan for a new John F. Kennedy airport. We will be announcing other important infrastructure projects statewide this week. At the same time, we must be ever mindful of the ever present threat of terrorism, especially in New York City. Our success breeds envy and envy makes us a target. So when we build, we will be implementing new anti-terrorism prevention measures, increased police presence at our bridges, tunnels and airports, new electronic security and tolling equipment that will read license plates both to move traffic faster and also afford police a new effective law enforcement tool they’ve never had before. We must also continue to invest in the industries of tomorrow. In this state, with all our diversity, there is no one size fits all so we work region by region. In Buffalo, our medical research industry is growing in combination with the UB Medical School, in Rochester the engineering legacy of Kodak, Xerox, and Bausch & Lomb is birthing the photonics industry. Our REDCs are doing great work – and I propose another $750 million in economic development funds to keep the growth going and the jobs being delivered. Today, I am excited to announce we are going to invest $650 million to help fuel the new life sciences economy, starting right here in New York City. We are partnering with Johnson and Johnson and the Genome Center to advance cutting edge genetic research that will save lives and create jobs and New York is the place to do it. We will also work to strengthen our outer boroughs – as I am a native outer borough boy as you can tell from my accent – we will invest in the Kings Bridge armory and Orchard Beach for more desperately needed urban recreation opportunities and invest $50 million in Montefiore Hospital to preserve affordable healthcare. We will offer residents of Staten Island permanent Verrazano toll reductions and make their Institute for Behavioral Research part of the CUNY system. Queens will see two new airports – a new JFK and a new LGA, because I’m from Queens. We want to make Brooklyn a new model for healthcare incorporating prevention strategies into lifestyle and community development. Better food and diets with green markets offering New York certified organic products from farms and businesses in New York. We will be building more recreation facilities, more community based clinics and we will make Brooklyn a model for wellness. We have an exciting opportunity to attract jobs because the economic cycle has turned. Many corporations that went overseas for cheap labor have learned a very important lesson – they learned that sometimes you get what you pay for. They are coming back to the US and we want them to come back to New York. But the key to getting the jobs of tomorrow is having an education. Advanced manufacturing requires skill and an education. The truth is that automation have taken American jobs for more than any immigrant has taken American jobs. But it has always been that way. During the industrial revolution, textile workers protested that machines and steam engines would destroy their livelihoods. Technology takes jobs, but then it creates more jobs than it destroys. Who gets them? People with an education get them. That is why in this session I am proposing tuition free college at our SUNY and CUNY schools and our community colleges for students or families making up to $125,000. That’s 80 percent of our people. One million families. It will change lives. It will restore hope for thousands of children who never believed they would make it to college. This program is a statement of New York values. Education is a right, not a privilege, it shouldn’t be about income, zip code, or ethnicity and that’s why I will also propose the Dream Act to help make all our children’s dreams come true. To further level the playing field we will offer additional help to children in schools with poor districts. In 2017 the P word, poverty, is still a challenge we must address. We are proud that we pioneered our state-wide pre-k program, the first in the nation, but we need more. Today, we are announcing a new pilot after school program that will target New York City and other cities in the state with our poorest communities. It will provide extended school hours for after school mentoring, tutoring, and recreation – all in a safe environment. Creating a state that is economically competitive, means keeping regulations sensible, our government entrepreneurial, and taxes low. This year I propose we provide additional relief with a Middle Class Child Care Tax Credit. The average cost to send a child to day care is $25,000. This year we will double the credit to help reduce child care costs to more than 200,000 working class families. That will make a difference. I believe these measures will help alleviate the middle class anger. Properly focused, the energy generated by that anger, in a positive way, it can become a great force for reform. But misdirected anger can be destructive. It can scapegoat and it can demonize, it can spread fear of those who are different, and it can destroy the uniquely American values and progressive principles that are the foundation of this society. The number of hate crimes that has erupted recently in New York is disturbing: KKK flyers, swastikas, white supremacist and anti-Semitic rants. Happening all across the state. It is as disgusting as it is ignorant and anti-American. We know in New York better than anywhere - we are all immigrants, unless you are native American – we all come from different places -and we not only coexist in America, we cooperate and work together and forge community. That is what makes this nation unique on the globe. We share benefits and we share burdens without discrimination or judgement. That is the American promise and that is the New York legacy. New York knows that our progressive principles of acceptance and diversity are not the enemy of our middle class and we know that the middle class success is not the enemy of our progressive beliefs. In fact, it was the progressive policies that created the nation’s middle class in the first place. President Roosevelt put people back to work, while he regulated banks, establishing a minimum wage, creating labor rights that built labor unions, social security, and building infrastructure, all at the same time. The answer for people who believe they are not getting a big enough piece of the American pie is not to try to take the piece of pie from your neighbor, it’s not to fight for the scraps left by the rich, the answer is to grow the pie for all. And that’s what we have to do. And if this is going to be a debate in this nation – you have heard our philosophy. At these stormy times of instability and confusion – let the great state of New York serve as a safe harbor for the progressive principles and social justice that made America. We will hold the torch high to light the way. That is New York’s promise. And it is unequivocal. This promise is not just in words; it will be in actions. We will protect the social progress we have made and we will push even harder. Or New York promise starts with a public private partnership with law firms so every new immigrant is protected with legal representation, even if they can’t afford it. Next, we will expand indigent legal services for criminal defendants to honor the constitutional promise of Gideon v. Wainwright. We will be the state of law and order but also the state of compassion and common sense. We will work to improve the justice system and end racial and resource inequities. We will propose ground breaking reforms: we will video tape interrogations, improve fairness in lineups, and raise the age of criminal liability from 16 to 18. We will reform our bail system to weigh the public safety risk posed by an individual because we accomplish absolutely nothing locking up people for years who pose no threat to the public who haven’t even had the right to a trial. We will honor the promise of a speedy trial because Riker’s Island is an insult to Lady Justice. I want to thank our great chief judge of the court appeals, Janet DiFiore and the court of appeals – thank you for the guidance and advice on these reforms. The New York promise continues, because we believe individual health is public health and quality affordable health care is a human right. We will not go back to a place where nearly 3 million New Yorkers are uninsured or Medicaid is decimated and our world class New York health care system is dismantled. We will not allow that to happen in the State of New York. We’re going to work with 1199 and the greater New York Hospital Association to make sure that doesn’t happen. We will protect our environment because we believe in the Native American proverb that we did not inherit the earth from our parents but that we are borrowing it from our children. We will invest a record amount in our Environmental Protection Fund, develop off shore wind power, and lower the RGGI emissions cap by 30% by 2030. And we will take bold steps to make us safer. New York City sits 30 miles from a ticking time bomb: the Indian Point Nuclear Power Plant. 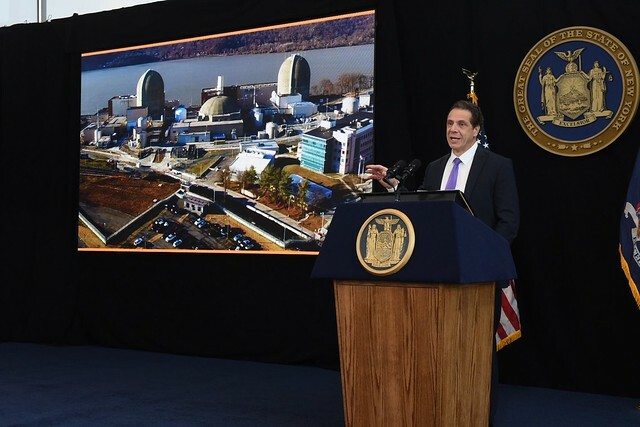 Nuclear power can be a useful bridge as we transition to renewables, there is no doubt, but Indian Point is located in the most densely populated area of the state, and in the most densely populated area on the globe. There is no nuclear power plant closer in such a densely populated area. An evacuation of this region would be all but impossible. I have been there many times to review operational issues at the plan. And there have been many operational issues. I have been personally trying to close it down for 15 years. Finally, this year, I am proud to announce that we have an agreement. Indian Point will close in 4 years, 14 years ahead of schedule – at no cost to the state. Our plan identifies sources of replacement power and transitions workers to new jobs. This agreement eliminates a major risk and provides welcome relief - New Yorkers can sleep a little better. I want to thank New York State Attorney General Eric Schneiderman who really did great work on this matter. Please Eric stand so we can acknowledge you. I’d also like to ask Richard Kaufman and Jim Malatras to stand, who did great work on my team. We will improve our democratic processes and propose early voting and automatic voter registration because we should do everything we can do actually get people to vote. We will advance women’s rights and equal pay by adopting salary history blind hiring practices and requiring all state contractors to report employees’ gender and pay. And make no mistake, New York will always stand up – and stand tall and stand firm – to protect a woman’s right to choose. We will fight the scourge of homelessness. Last year we made a historic $20B commitment to fight pervasive homelessness and the affordable housing shortage. The money is there, the largest state commitment in history. and 6 months ago I signed the MOU to release the funds. Neither the assembly nor senate has joined me in moving this forward. Today, I call on the Legislature to advance the historic affordable housing plan initiated in 2016, providing 100,000 units of affordable housing across the State, and 6,000 units of supportive housing, primarily in New York City where the homeless crisis is most dire. We need it now, we need it in the winter, it is time for the state legislature to act. We will enforce our anti-discrimination and our hate-crimes laws in every instance of prejudice. I am proposing a new State Police and Department of Human Rights Education and Enforcement Task Force because hate and discrimination have no home in New York and no infraction will be tolerated, period. We will also come together as New Yorkers under Cardinal Dolan’s efforts to organize interfaith religious leaders and congregations to share and educate New Yorkers about the commonalities in our different faiths because religious freedom and individual liberty are New York hallmarks and we need to focus on commonalties opposed to artificial distinctions. Thank you your eminence. We thank him. In closing my friends, yes we have challenges, but we have been challenged before time and time again, and if there is one thing New York knows it is to get up and we know how to rise above. It is who we are in our essence. We will calm the waters, we will stop the opposing currents and we will align the energy of both. When all are headed in the same direction that will create a current that is so strong it pulls all forward. As New Yorkers living in this great state of diversity, we know that inherently that anger against one another doesn’t work-engender a spirit where we help one another. We stand today at a site of 9/11. This is the site of the greatest hatred and the greatest cowardice and anger in modern history. But this is also the site of the greatest response, which was love and reaching out and understating and people coming together and not seeing differences but seeing souls and character and fellow human beings and seeing Americans, and we saw that unity is undefeatable. People from all across the state and all across the country and all across the world and said were not New Yorkers but were here to help because were human beings. When we are at our best, we don’t focus on disparity, we focus on commonality. That’s what this is all about. In New York we know it because New York was the stepping-off place of America. It is the laboratory of experiment in America. If you want to start to point fingers at people who are different, you’ll be pointing all day long. There is only one strategy to make this work – come together and see humanity and cooperate. It’s about pulling people together. We know that it’s not upstate or downstate, it’s upstate and downstate, it’s not Democrat or Republican, its Democrat and Republican, it’s not gay or straight, it’s gay and straight, it’s not Christian or Muslim or Jew, it’s Christian and Muslim and Jew. Its old immigrant and new immigrant. Forging community from that group and that alliance. And that is New York. That is what we do. Our founding fathers said it in three words - It is e pluribus unum – out of many one. The founding premise of the nation. That is the enduring promise of the nation. That is a lesson that lives in this state. Our people need to know that yes the winds are strong and the seas are rough our principles will guide us and New York will show this nation once again that New York must remember to heed our better angels for this lesson and display it for this country once again because the greatest success is shared success and the brightest future is the one we build together. Excelsior and god bless you.